Boleto Bancário is one of the most popular online/offline payment methods in Brazil that allows you to pay for Skype Credit and subscriptions. You cannot purchase a Skype Number with Boleto Bancário. Boleto Bancário payments are offered by our local service provider, the GT Group*, and supported by the payment services provider GlobalCollect™. You can pay using Boleto Bancário in our web store, the Skype application or Skype Manager™. When you pay with Boleto Bancário, you can either visit a bank or retail outlet to make the cash payment, or pay via your online banking account. Although we provide you with a payment confirmation in real time, the payment can take a little while to go through – generally 3 to 7 days from the date of payment for the product to show up in your Skype account, but it can take longer depending on your bank. 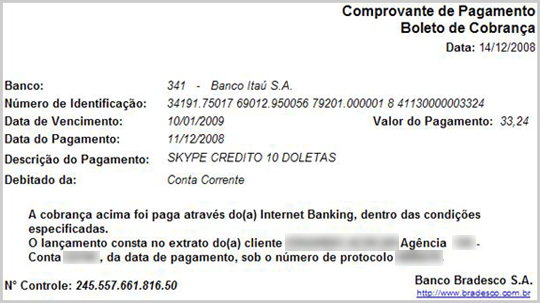 How do I pay with Boleto Bancário using my personal Skype account? How do I pay with Boleto Bancário using Skype Manager? 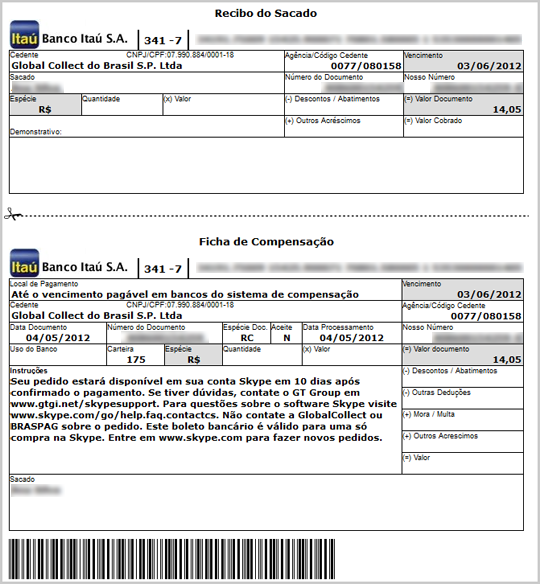 Does a Boleto Bancário payment slip expire? Select the Skype product you’d like to buy. Click Change under the Paying with section on the right side of the screen, select Boleto Bancário as your payment method and click Next. 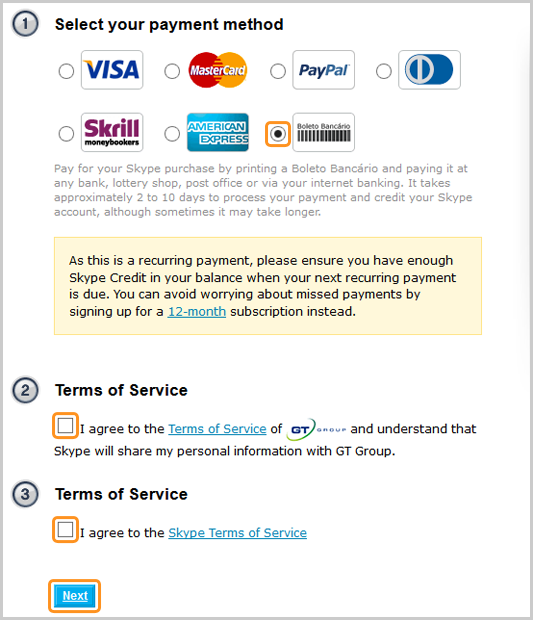 Read and agree to the Terms of Service of the GT Group and Skype, then click Next. Select Boleto Bancário as your payment method. Read and agree to the Terms of Service of the GT Group and Skype, then click Next. You can check your order details, including the local ICMS tax. Enter your individual taxpayer registry number (CPF). The payment will be made in your local currency, which can lead to currency exchange fees. You’ll be directed to the final page where you can find the instructions to complete your payment. You can then choose to make the payment via online banking or in a local bank or retail outlet. If you decide to make the payment at a bank or retail outlet, don’t forget to print the Boleto payment slip and take it with you when you go to pay. Important: When you pay via internet banking, make sure you include your unique payment reference number (the long one at the top of your payment slip) when you complete the payment. Skype uses this to match your payment to your order. Each Boleto Bancário can only be used for one purchase on Skype. If you have already paid for Skype products using Skype Manager before, you won’t need to enter your company’s billing address again. Remember: The payment will be made in your local currency, which can lead to currency exchange fees. You’ll also be able to change your company’s billing address details at the top right by clicking Change details. Enter your company’s billing address details. You’ll need to select Brazil as the billing country. Click Next. Select Boleto Bancário as your payment method. Read and agree to the Terms of Service of GT Group and click Next. Check the amount you’ll pay, including the local ICMS. Enter your company’s identification number (CNPJ), if you haven’t done so before, then click Next. Complete your payment at a bank, retail outlet or online using your bank’s website. If you’re paying at a bank or retail outlet, don’t forget to print the Boleto payment slip and take it with you when you go to pay. Each Boleto Bancário can only be used for one purchase on Skype. Yes, each Boleto payment slip has an expiration date, shown in the upper right corner of the receipt. You have 30 days to pay for the order. We recommend that you make the payment as soon as possible. If your order has not been delivered, contact your bank and mention that the payment has to be completed as soon as possible. For help and support about payment issues please contact GT Group Support*.